I know what you’re thinking. 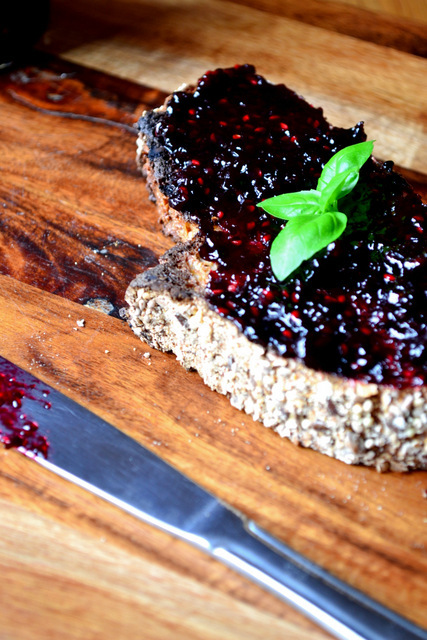 You’re thinking that blackberry and basil seems like an odd combination to use in a jam recipe. You’re right. It is. But it’s a combination that works brilliantly well. Don’t think of the basil as tasting as it would in a pesto dish; it doesn’t come across as powerfully. 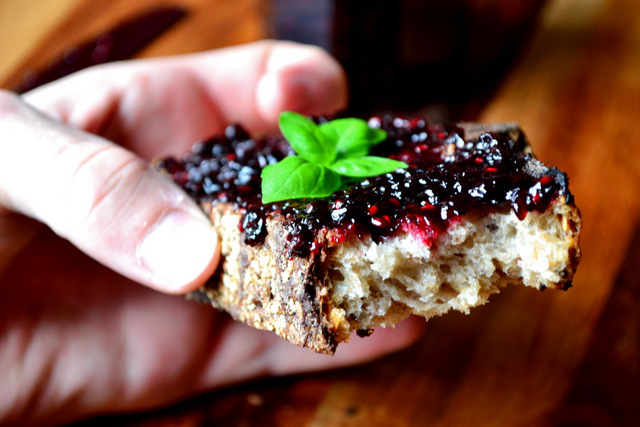 Instead, this Blackberry and Basil Jam is a sweet and fragrant preserve, which will be enjoyed without so much as a frown. Attempting to successfully balance basil with a strong-flavoured fruit like blackberry is quite tricky. Too little and the flavour will be lost. Too much and you’ll taste nothing else. 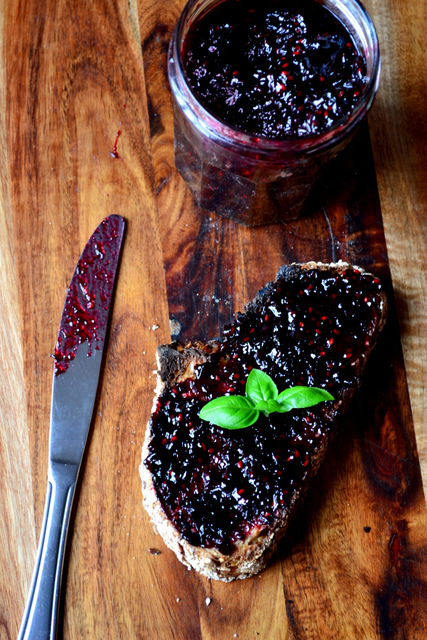 Essentially, what you should be aiming to achieve with your blackberry and basil jam is a subtle fragrance. At first you’ll get the full punch of delicious, juicy blackberry, followed by a gentle basil aftertaste. Obviously, you could chose to make more of the herb if you’d like, but it wouldn’t work quite as well. Delicacy is important here. 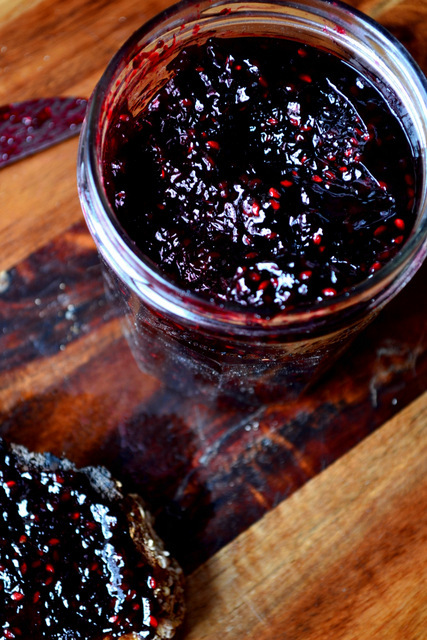 One thing to note is that blackberries are relatively low in pectin. Leave the lemon juice on the sidelines and you’ll end up with a very loose jam indeed. However, if you don’t have a lemon to hand you can substitute the granulated sugar for jam sugar, which contains added pectin. Otherwise, this is a very simple recipe, ready in around half an hour and perfect spread on a slice of sourdough toast in the morning. Tip the blackberries into a large jamming pan over a high heat. Tip in the sugar and lemon juice. Pop a small plate in the freezer for testing the jam. Once the berries have started to release their juice, put the basil in a food processor along with 100ml of blackberry juice. Blend until smooth and return to the pot. While the jam is boiling away furiously, boil the kettle and fill 4 jam jars and their lids with boiling water. Of course, you can sterilise your jars however you’d like. Gently stir the jam while it’s boiling; it shouldn’t be allowed to catch. After 15 minutes begin testing your jam on the frozen plate until it wrinkles when pushed. At this point remove the jam from the heat, empty the jars of any water and fill them with the prepared blackberry and basil jam. Immediately seal and set aside to cool completely. Stored in the fridge, these jars of jam should last for many months and probably well over a year. Cost: So plentiful are blackberries at this time of the year that if you’re buying them from the supermarket then you’re being a tad foolish. Go out and pick them yourself and you can easily make this jam for 70p; even less if you also grow your own basil. Wonderful idea! Eaten all my blackberries this year but will remember this for next. That’s a shame, but please do – it’s a delicious recipe. Beautiful photos, as always. Jam looks gorgeous! Thank you very much! It was even more delicious. What were you thinking? Mascarpone? Oooo..that sounds absolutely fantastic! Wish a had a batch of blueberries and a clump of fresh basil on the hand…so curious about the taste. Blueberries would work too I’m sure; though I suspect you meant to write blackberries! Ah! Didn’t catch you early enough. Next year, yes! never heard of putting herbs in jams but it looks legit. adding to future recipes. thanks! 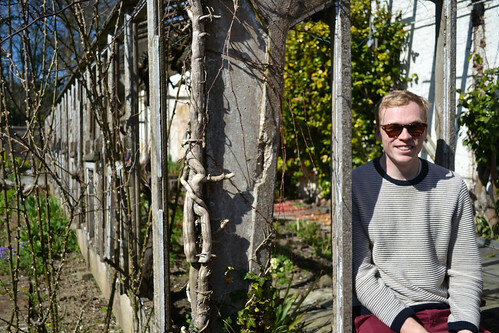 IT works well – don’t worry!